(usually barefoot) meg: I'm not an Introvert nor an Extravert. I'm both. I'm not an Introvert nor an Extravert. I'm both. I've had many people tell me that they're neither introverted nor extraverted. "I fall right in the middle," they exclaim, rather proud that they can't be put in a box. I've always tried to point out that "Yeah, of course you're a bit of both. But you're probably a bit more one than the other." Then follows the usual discussion of what does it even mean to be one or the other and finally a repeat of their denial that either description fits them very well. I've continued to study the difference between introversion and extraversion (as well as the differences in the other preferences that make up the Meyers-Briggs type descriptions) and I maintain that people are a bit of both, but still fall more one way or the other. However, I've also come to understand what the two terms mean so much more clearly (It's not all about whether you like hanging out with people or not.) and probably better yet, I've started figuring out what the functions are all about. And understanding the functions, in my opinion, makes all the difference in the world. Stop thinking about introversion and extraversion in terms of people. It's not all about whether you like crowds or just being with a couple of friends or meeting complete strangers or avoiding people entirely. Wipe all that from your mind and let's start fresh. Think of introversion and extraversion as arrows. The first one points inside a person. The other one points outside a person. ... They're not pointing at people! Stop that. Didn't I tell you to stop thinking in terms of people? We'll add people back in later. But right now I want them out of your head entirely. *Waits, drumming her fingers on her desk. * Are they out? OK, let's continue. When a person is being introverted (notice, I didn't say an introverted person. So I'm not just talking to introverts here. I'm talking to everyone, because everyone is introverted part of the time.) that's a time when they're looking inside themselves at stuff. They could be looking at feelings, or ideas, or data, or memories, or well... anything else that's inside-ish. When a person is being extraverted, on the other hand, that's when they're looking outside themselves. (That doesn't mean they're being selfless. That's something else entirely. You can be completely selfish while looking outward.) While extraverting, a person is interacting with things that are other. That could be people, but it could also be nature, or textures, or distances, or a whole host of other things. But like I said, everyone tends to behave more one way than another. Some people do the pointing in thing more, but there are times when they're pointing out so much you might never think of them as being an introvert. And there are extraverts who usually interact with everything around them, but there are times when they're a bit more reflective or thoughtful or pensive and therefore look very much like introverts. In terms of functions, your primary function will match up with whether you're extraverted or introverted. Your secondary function will be the opposite. There's a lot more to functions, but I'm going to save that for another post. 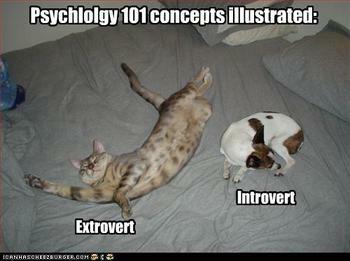 The point I want to make here is "Yeah, you are both introverted and extraverted. Good on ya. But whether you want to cop to it or not, you operate more in one mode than the other. You just do. And the rest of your personality type (the S/N and T/F stuff) is affected by your primary mode of being either extraverted or introverted. Stay tuned for the "flavors" of extraversion.